Got no water? If you suspect that the cause of the problem is a frozen pipe, this article will help you locate the blockage, defrost it and make sure your pipes don't freeze again. If you find yourself without water, the first thing you need to do is check whether your neighbours are also affected. If they are, the lack of water will most likely be caused a problem to the mains supply and you will need to contact your water company. If you're the only one without water, you probably have a frozen pipe. It's important to try and defrost this blockage as quickly as possible as the expansion of the water could cause the pipe to burst, leading to thawed water leaking from the break. Looking for evidence of freezing along the pipes. Using your hands to feel along the pipe until you reach a section that feels colder than the rest. You may find it helpful to compare the temperature of the blocked pipe to that of a pipe where you know the water is flowing freely. 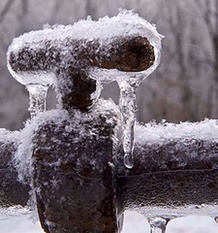 Once you've thawed out your pipes, check them thoroughly for any signs of damage or leaking. If the pipes have been damaged, you will need to call out an emergency plumber to fix the problem. It's a good idea to check your insurance policy as soon as possible, as this may cover the costs of alternative accommodation for you and your family (if necessary).